MTNL's corporate website could not be accessed, following the attack since afternoon and officials said efforts were underway to restore it. 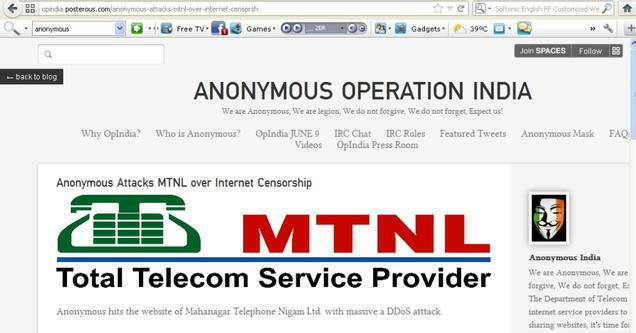 MTNL Delhi, Deputy - GM (Internet), Deepak Sharma said it was not hacking but 'denial of service attack' under which the server is unable to provide services to the customers. Anonymous has called for non-violent protests across several cities in India on June 9 to protest against what it alleges as ‘censorship’ of the internet. It accused the department of telecom of instructing the Internet Service Providers (ISPs) to block file-sharing websites unilaterally, while the courts had ordered blocking of certain websites. As part of the protests, Anonymous has also asked all citizens to wear Anonymous’ (Fawkes) mask, dress completely in black and step out on the streets to protests. This is the latest in a series of such attacks in the over the past month by the group, which has targeted the websites of the Internet Service Providers Association of India, the Trinamool Congress and Reliance Communications. The government has so far refrained from making any comments on the concerted campaign by Anonymous over the last 15 days.